Is it luggage or a CD case? You remember Slappa, don’t you? They make a line of CD and DVD cases which, in my experienced opinion, are the best way to protect the hundreds or thousands of dollars you’ve invested into plastic 5-inch diameter discs. In case you don’t remember, read our original review for a Slappa case refresher. Well, now they are back, this time with a unit capable of storing 600 of your favorite CDs! This thing looks awesome. You can pre-order it now from Slappa.com now for $129.99. Tell them livedigitally sent you (literally!). 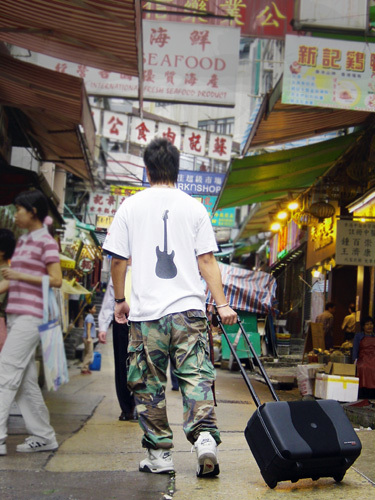 Here’s Gary walking through the streets of China sporting the new Slappa 600 CD case. Notice the confidence in his stride, a definite coolness factor increase. Not only is he hip, but in the event of hot coffee, raw eggs, re-proving F=1/2mgh (force due to gravity at certain height), or a 5 minute fireball, all 600 discs are completely out of harms way. by the way, this is a “Contest Post“!! Not even I have enough discs to fill one of these things up! This looks durable enough to survive the Mini bounce my daughter’s pink iPod does about five times a day. Looks like it’d fit in an airline overhead bin… Good. Does anyone know what 600 CDs (in jewel cases) weighs? That’s the beauty of the SLAPPA CD cases, you get to ditch the jewel cases. You can store your CD and liner notes together in the d2 pockets without the extra weight and bulk. Ok you made your point–Slappa CD cases are really hot and durable and perfect for travellers and audio junkies. Ok you made your point—SLAPPA CD cases are hot! Perfect for travellers and audio Junkies alike.